Preheat oven to 350°F. Meanwhile, combine equal parts water and chicken broth (just enough to cook your macaroni in) in a large pot and bring to a boil on the stovetop. Add macaroni and cook until al dente according to instructions on box (usually about 7-8 minutes). When macaroni is done, drain and set aside. In a large saucepan over medium heat, melt butter and whisk in the flour. Cook for about a minute, whisking constantly. Keep whisking as you add in 1 cup chicken broth, half-and-half, and milk; continue whisking until fully combined. You want the mixture to steam but NOT boil. Adjust your heat accordingly. Add in the cream cheese and stir until completely dissolved and smooth. Remove pot from heat and add in 4 cups of cheese, stirring until smooth. Pour cheese mixture over cooked macaroni and stir to combine. Add some black pepper if you'd like. 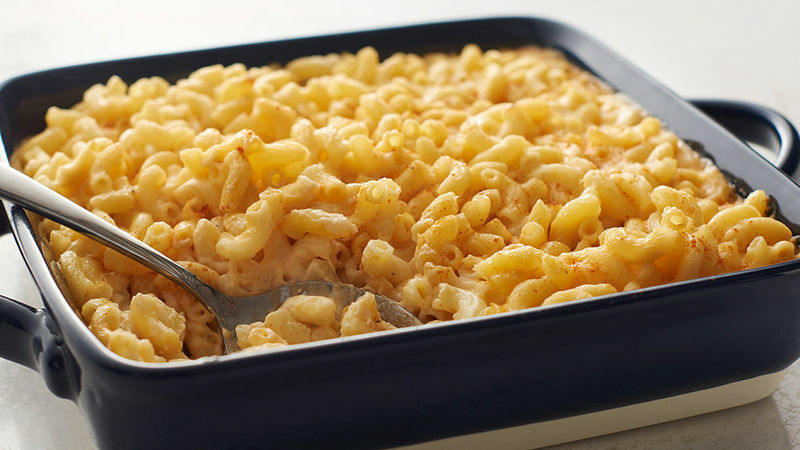 Grease a 9x9-inch baking pan with butter and pour mac and cheese into it. Bake in preheated oven for 25-30 minutes until slightly jiggly, making sure not to overcook. The macaroni will set and firm up as it cools. *Top with additional shredded cheddar cheese (desired amount) and dashes of paprika. The combination of four different kinds of cheeses takes this baked mac and cheese recipe over the top. The recipe calls for sharp cheddar, mozzarella, gouda and muenster, but really, you could use any type of cheese you’d like, including homemade mozzarella. It’s easier than you think thanks to this delicious step-by-step guide on how to make it from scratch. If you want to spice this cheesy pasta dish up a bit, sneak some shredded Pepper Jack cheese in. However you like your mac and cheese, we have a recipe for the classics and the twists, from the stovetop version to making it in your slow cooker.